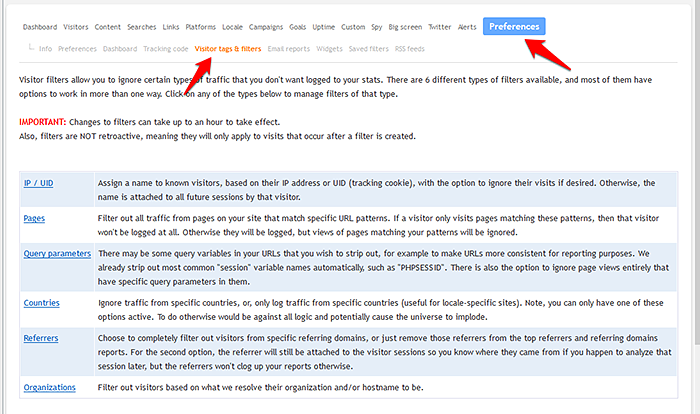 Filter out traffic based on country, organization, referrer, and more! Well, no fret! These types of filters, and more, are now officially supported directly from the new "Visitor tags and filters" site preference page. These are all of the filters you can create from this new filter hub. And like the IP/UID filters of yore, every filter can either be site-specific, or apply globally to all sites in your account. IP/UID - This was what you used to do from this page (and nothing else). Filter out traffic based on IP address or UID (tracking cookie). Pages - Filter out page views that match specific patterns. This used to be part of the main site preferences page (hidden under "advanced"), but we wanted to centralize all filters, so it's here now, and with much better wildcard support than there used to be. Query parameters - Enter in query parameters you want stripped out from URLs (the main purpose of this filter type, to help normalize your content report), with the option to also ignore those page views completely if they contain these query parameters. Countries - Ignore all traffic from specific countries, or only log traffic from specific countries. Referring domains - Full wildcard support with this filter type. Two options here. Either ignore all traffic that comes from specific domains, or, log it and attach the referrer to the visitor but DON'T log the referrer to the top referrer (and related) reports. This second option is kind of weird but everything exists for a reason. Organizations - Filter out all traffic that we resolve to specific organizations/hostnames. Full wildcard support. Clicky is the best service in the biz when it comes to filtering out robot activity and spam referrers. We are able to be so good at this because you guys let us know about new ones that pop up in your logs. So while this new filter system can be used to filter out bot/spam activity immediately for your own account, we still want you to let us know if any traffic in your logs is suspect, so we can update our global block list to benefit everyone. So don't let this make you lazy! Have you considered creating a button/link in the app to report spam-referrers? Yes, I've played around with the idea but I haven't come up with a way to put it in the UI without being distracting/annoying. I forgot to mention in the post, the "Pages" and "Query Parameters" filters were both previously on the main site preferences page and we migrated both onto this page. The part I forgot to mention is that we migrated your existing filters to the new system as well so they should still all be there and working as they were previously.